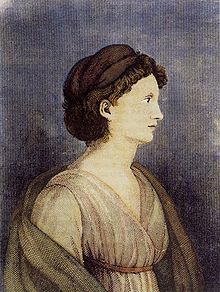 Karoline von Günderode 11 February 1780 – 26 July 1806 romantic poet, her works often had strong heroic women in the central role, and was critical of traditional gender attitudes. I have to say she behaved a bit like an opera heroine, and this doesn’t strike me as entirely a good thing – Jane Austen would have had comments to make about sensibility. I’ve often had the unfeminine desire to throw myself into the wild chaos of battle and die. Why didn’t I turn out to be a man! I have no feeling for feminine virtues, for a woman’s happiness. Only that which is wild, great, shining appeals to me. There is an unfortunate but unalterable imbalance in my soul; and it will and must remain so, since I am a woman and have desires like a man without a man’s strength. Sounds good doesn’t it, but she had an affair with a married man Georg Friedrich Creuzer, who divorced his wife to be with her. Unfortunately, persuaded by his friends that Caroline was unsuitable, he left her. (Or depending on which version you go by, he wouldn’t divorce his wife). As a result of the stress he got ill, and Caroline, believing he was dying (or furious he wouldn’t divorce his wife…), killed herself… Georg survived the illness (if there was one). Actually, not sure why I’m including her, I’m writing this and thinking, idiot! But there you go, idiots abound, and sometimes they can be fun to be around, briefly. I think I would be delighted if she declined the invitation, I’d be having to keep an eye on her the whole time, and keep counting the knives: not restful. This entry was posted in feminist, history, poetry, The Historical Birthday-Tea Party and tagged History, Karoline von Günderode, Poetry by Cherry Potts. Bookmark the permalink.